The three-tiered Koyasu Pagoda (子安の塔) at the entrance gate to Kiyomizudera, possibly one of the most celebrated buddhist temples of Japan. The temple itself is behind the photographer. The pagoda contained an image of the buddhist deity Koyasu Kannon, which is believed to ease childbirth. 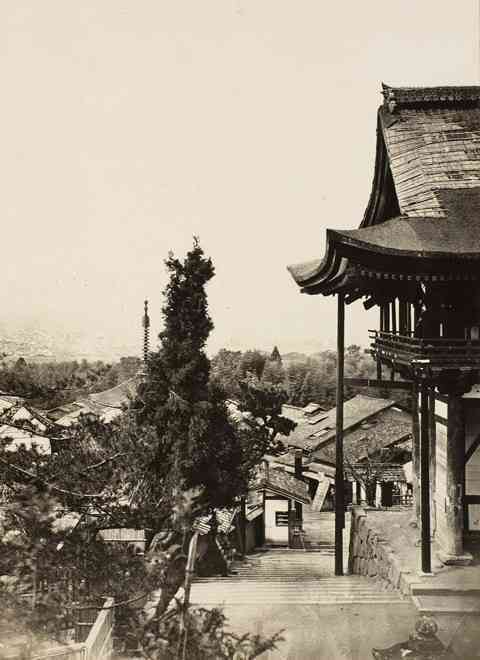 In 1911 (Meiji 44), the pagoda was moved to a valley next to Kiyomizudera. It still exists and looks beautiful in Spring when it is surrounded by countless cherry trees in full blossom. Visitors to the temple would climb a steep winding road, called Sannenzaka (産寧坂, nowadays often written as 三年坂). It was flanked with a multitude of souvenir shops. These sold especially statues of such kami (deities) as Inari, the kami of fertility, agriculture (especially rice) and business success, usually represented as a cute fox. Some shops can actually be seen in the background of this photo. There are still souvenir shops on Sannenzaka today, but they have replaced their religious goods for more commercial fare. In one of those shops a wonderful woman in her eighties told me her memories of when she first started working there. “Most people in those days came to pray,” she recalled. “Now there are far more people, but they are mostly tourists.” Although the shop made more money now with all the tourists, she explained, she missed the old days. The stone pillars at the entrance gate on this image were erected in August 1883 (Meiji 16). Like the pagoda, they have long since been removed and the entrance area today doesn’t resemble the above image at all. It is now a wide open space gratefully used by the millions of tourists that visit Kiyomizudera every year to take photographs to remember their visit by. Koyasu Kannon is an interesting deity. She is widely accepted as being Buddhist, but actually used to be a Shinto deity known as Koyasusama, based on the mythical princess Konohana-sakuya-hime (木花之開耶姫), goddess of Mount Fuji. Her symbol is sakura (cherry blossom), possibly Japan’s most loved flower. In the myth, Konohana gave birth to a son in a doorless hut which she set on fire to proof to her husband Ninigi-no-mikoto (瓊瓊杵尊) that the child was his. If it was truly the son of Ninigi, who was the grandson of the sun goddess Amaterasu, it would not be hurt by the flames, she claimed. The son was born unharmed. Besides being revered for providing for safe births and being a model for fidelity, she is also a guardian deity for the prevention of fires, ocean voyages, fishing, farming, weaving, and more. After Buddhism entered Japan, Konohana was slowly absorbed by her Buddhist equivalents. However, there are still some 1300 Asama Shrines in Japan dedicated to Konohana. The head shrine is Fujisan Hongu Sengen Taisha (富士山本宮浅間大社) in Fujinomiya, Shizuoka Prefecture. Kiyomizudera is the head temple of the Kita Hosso sect and still exists. It was first founded in 798, but the current buildings were constructed in 1633. It is a fudasho (an office where amulets are distributed to pilgrims) among the 33 spiritual places of western Japan. The temple is especially famous for its enormous overhanging wooden veranda. 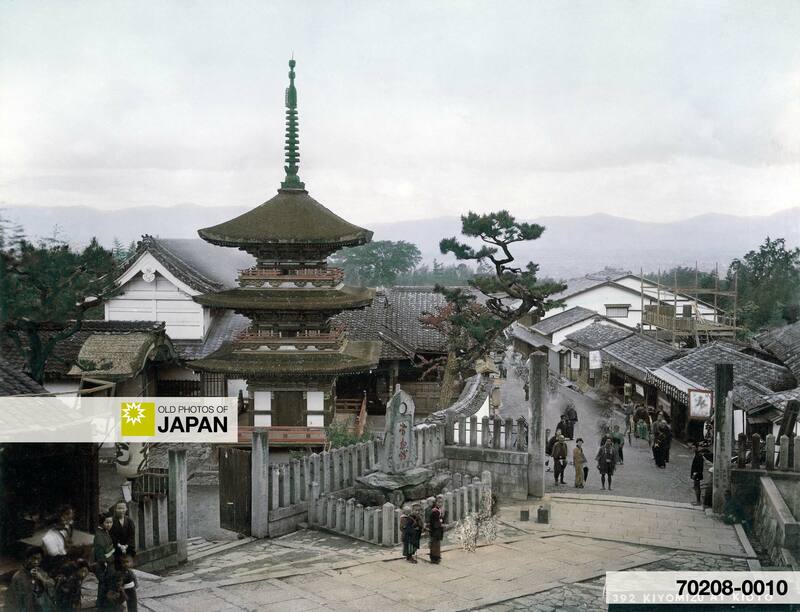 For more information about Kiyomizudera, see Kyoto 1880s • Kiyomizudera. I have tentatively attributed this image to Nobukuni Enami. The numbering system in this image appears to be his, and there actually exist photographs attributed to Enami labeled “390 Gojiyosaka” and “393 Kiomitsu”. This one, labeled “392 Kiyomizu at Kioto,” fits perfectly in-between. You can also licence this image online: 70208-0010 @ MeijiShowa.com. It looks like the people in the picture are looking back at the photographer. Absolutely. You must consider that the photographer carried a lot of equipment and possibly had a tent nearby to develop his image. Cameras were also still very rare and always peaked the curiosity of everybody around. You wrote that the stone pillars at the entrance gate on this photograph were erected in August 1883. Have you ever came across an earlier image? A digital image I have on my computer doesn’t feature them and in the place of the stone monument stands a small building <too fancy to be a simple shed>. I’m wondering what was it’s purpose. Thank you for your message, Noel. Beato and Stillfried visited Kiyomizu Temple. Both were active before this photograph was shot. However they didn’t photograph the same scene and instead shot this area from behind Nio Gate, so it is not clearly visible. I would love to see your image, and am especially curious about the building. As I don’t have my own website I used Imgur to upload the photos. I’m guessing they must’ve been taken only few years apart, but they show significant changes in the neighbourhood. I am familiar with the lower Imgur image (with the number 863). 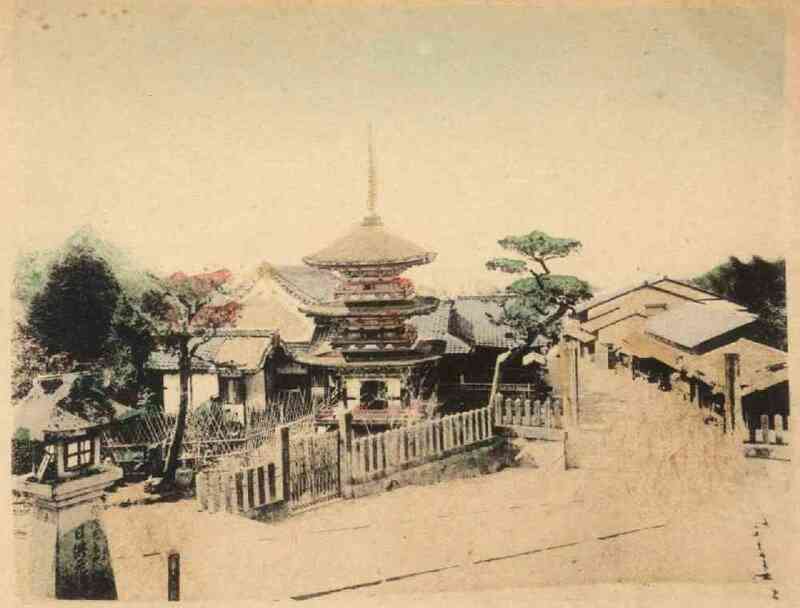 I am doing research on Kusakabe Kimbei and this image was in his catalogue under the number 1311 (“Koyasu Pagoda at Kioto”). His catalogue contained work by Uchida, Beato, Stillfried and Yamamoto, so it is not sure who photographed the scene and when. However, I assume that Kimbei took it himself. Kimbei opened his first studio in 1880. Although he didn’t retire until 1914, photography was not his main endeavor anymore by then. He was mainly active as a photographer in the 1880s and 1890s. His catalogue was published around 1893. I found a photo of this spot published in The Far East of June 17, 1872. The small building in front of the wall is already there, but looks slightly different. In the Japanese text on the linked page it says that the function of this building is unknown. So the top Imgur photo was photographed sometime between June 1872 and August 1883. The bottom one was almost certainly photographed in or right after August 1883. The work on the stone pillars has only just finished. Now we need to discover when the building was replaced with the stone with the text, visible on Enami’s photo (the one on this page). But your two images were clearly photographed before Enami’s image. The bottom image is also published on page 71 of 幕末・維新彩色の京都. No mention of the small building is made in this book. The website you linked is such a great resource. I think that this postcard shows the moment “in between” – the solid wall that was visible behind the building has already been replaced by the stone fence. What’s more I just noticed that the mysterious building can be also seen in the photographs taken from the perspective of the Nio Gate ! As for the Kimbei attribution I’m somewhat reluctant. The image seems a little dated, more like Beato or Stillfried style. However Beato hardly ever put numbers on his landscapes and Stillfried ones had a different outline. While working on my private digital Meiji photo archive I’ve been trying to organize and identify specific series just like this one. I’ve also been mapping Kimbei’s series but I still have a lot work to do and I have only a few 800s catalogued so far. I will be impossible to establish 100% whether Kimbei actually photographed the scene or not, but there is no doubt whatsoever that he listed the image in his catalogue and sold it. I was quite surprised by your link to the catalogue on Flickr. I have been checking your work since you started posting it, and was intrigued by Rob’s (Okinawa Soba) suggestion that the work might be by Shinichi Suzuki II. Wonderful surprise to find out that it was you! As you can see my Flickr project is far from finished and there are still many blank spaces I need to fill. Rob’s attribution is yet to be confirmed, but I hope having all the photos organized might come in handy in the future. I am currently working on another series (focused around this photograph), that also needs attribution. I will probably post a compilation on Flickr before the end of the year. Yes, having that collection will be very helpful. Thanks for the link to Rob’s page on flickr. Very interesting discovery!